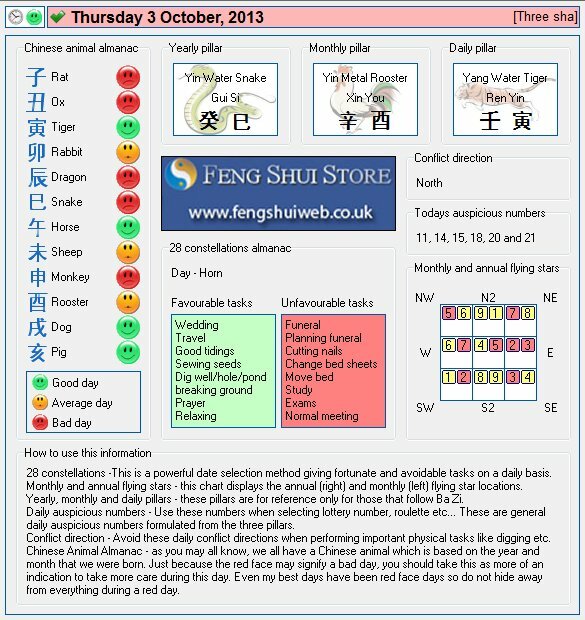 Here is the Free Feng Shui Tong Shu Almanac for Thursday 3rd October 2013. Years! Please use better quality coating on yor items. Sorry you are having problems with the jewellery but the only jewellery we sell is the Crystal power beads and these contain no gold or silver. Could you please tell me what products you have ordered from us that has flaked off and I will look in to it for you as the only products that I can see you have ordered from us do no not fit the description at all and we certainly do not sell monthly jewellery cures.